PIGEON FORGE, Tenn. (August 2012) – If you liked the July 4 fireworks during Pigeon Forge’s Patriot festival, hang on until Nov. 22. 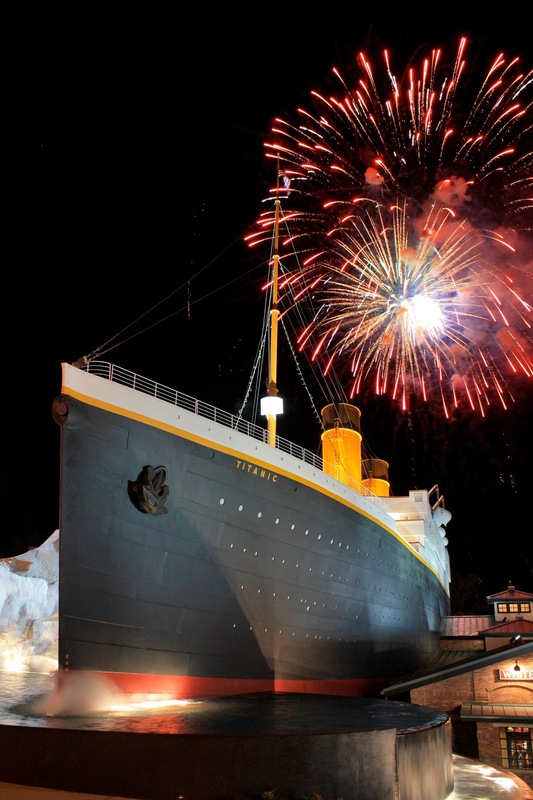 That’s the date when the Titanic Museum Attraction will light up the night sky with a major fireworks show that marks the end of the centennial year of the Titanic’s sinking. Attraction owners say the year has been a tribute to the 2,208 people aboard the ship in 1912 and that the fireworks show will celebrate the lives and legacies of the ship’s passengers, crew and rescuers. “We wanted to end the Titanic centennial year on a note of celebration and hope,” said John Joslyn, expedition leader of the first private exploration dive to the Titanic and co-owner of the Titanic Museum Attraction. After the fireworks show, the museum/attraction will renew its tradition of a snowfall from the ship’s bow Thanksgiving weekend and continuing every Saturday in December. Father Christmas, dressed in a style most familiar to the children aboard the Titanic in 1912, will visit on snow days.